Chart Generator – improving corporate websites. - nexxar lab. - nexxar lab. Chart Generator – improving corporate websites. Hard facts are of crucial importance to many stakeholders. Yet, many corporate websites provide key developments in form of tables only. The nexxar Chart Generator is one alternative to this: an interactive tool for visualising corporate performance indicators. Increasingly, interactive key figure comparisons find their way into IR and CSR sections of corporate websites. These tools, originally created for enhancing the interactivity of online annual reports, also add value to corporate sites. 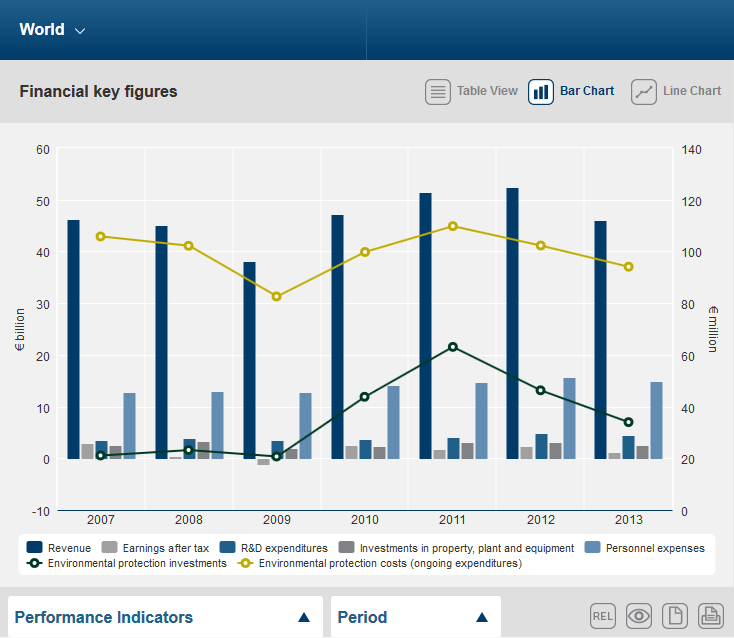 The nexxar Chart Generator for example enables stakeholders to easily get a quick overview of key performance indicators. Key figures can either be presented in a table, or in a dynamic bar or line chart. Furthermore, additional value is created by several options, such as an indexed view or direct Excel download. The design of this interactive tool will be adjusted to the corporate style guide, and can easily be integrated to corporate websites (e.g. under the IR or Sustainability section). Key figures and options are implemented according to individual needs. This tool offers several export functions. The tailor-made graphs and tables can be saved as images, HTML or Excel files. An additional printing option is also provided. Setting up an individual concept for the Chart Generator regarding usability and key figure selection is the first step. Once the design has been approved, the required key figures are implemented by means of the Excel interface. Generally, the Chart Generator can be made available within a few days. By means of an iframe, the Chart Generator can easily be implemented to any website. Alternatively, we offer stand-alone solutions for direct implementations.